NO BABY SHOULD DEVELOP BRAIN DAMAGE FROM UNTREATED JAUNDICE. We strongly advocate screening that looks like this. 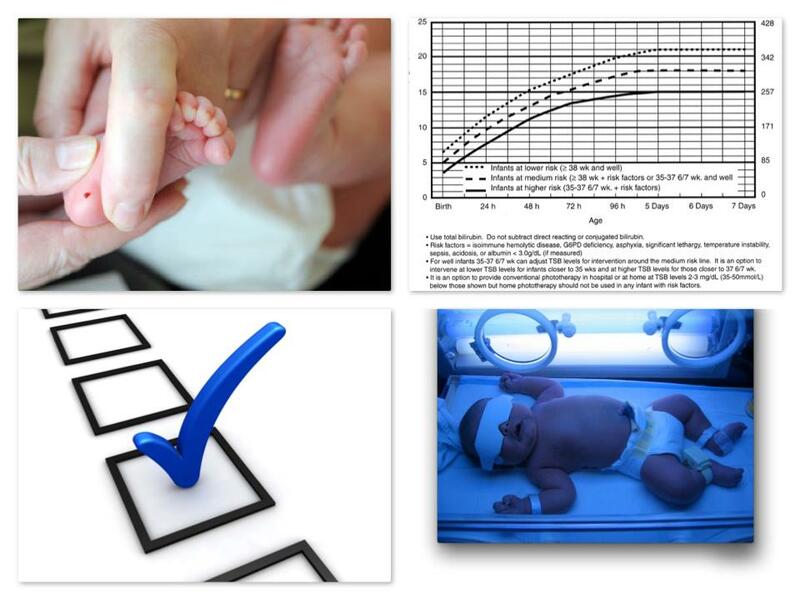 T – Test Blood – The most accurate way to measure bilirubin is with a small blood sample from the baby’s heel. This results in a total serum bilirubin (TSB) level. E – Evaluate Bilirubin Nomogram – Once you have the TSB level, evaluate it using the bilirubin nomogram chart or bilitool.org. Findings are based on the baby’s age in hours and the TSB level. MILD: IF THE BABY HAS MILD LEVELS OF JAUNDICE, IT USUALLY GOES AWAY ON ITS OWN. PLENTY OF FLUIDS OF FREQUENT FEEDINGS CAN HELP MAKE THE JAUNDICE GO AWAY. MODERATE: IF THE BABY HAS MODERATE LEVELS OF JAUNDICE, A DOCTOR MAY RECOMMEND PHOTOTHERAPY. DURING PHOTOTHERAPY, THE BABY IS PLACED UNDER PHOTOTHERAPY LIGHTS. THE LIGHT HELPS THE LIVER REMOVE BILIRUBIN IN THE BABY’S BODY. THE BILIRUBIN SHOULD BE TESTED AGAIN EVERY 24 HOURS TO ENSURE KERNICTERUS DOES NOT OCCUR. Jaundice will appear first on the face and then move to the chest, belly, arms, and legs as bilirubin levels get higher. The whites of the eyes can also turn yellow. Jaundice can be harder to see in babies with darker skin color. The baby’s doctor or nurse must test to see how much bilirubin is in the baby’s blood. NEVER rely on a visual assessment to determine whether your child is at risk. This is often how kernicterus occurs. HAS STRANGE EYE MOVEMENTS OR EYES ROLLED INTO THE HEAD. Great info… great website! I have been doing research on the kernicterus and jaundice and I was appalled when the study’s summary stated that because kernicterus was so rare, that to test every child was not cost effective! I work for an organization called g6pddeficiency.org and we are pushing to get babies tested for jaundice AND g6pd deficiency…as the more serious bouts with jaundice happen to babies that inherit this genetic disorder. I would definitely g6pd deficiency (a genetic disorder) to your list of risk factors for infants. This genetic disorder is more common in people of Asian, Mediterranean, or African descent, so that is why those babies with those ethnic characteristics are at a higher risk for jaundice. There needs to be more information given by hospitals about jaundice – on taking our premie home the pediatrician told us she has jaundice it’s very common just make sure her eyes don’t get yellow. I breastfeed and she wasn’t getting adequate nutrition because she wasn’t sucking effectively – she arched her back several times / no one caught it at her newborn visit it wasn’t until her two week visit they recognized a problem and had us supplement. I don’t know if she has any brain damage but it hurts me to see how this can happen and how a hospital will give you twenty pamphlets on “breast is best” but not even mention to new parents that jaundice can cause brain damage. There needs to be A LOT more education – no one would purposefully let this happen to their children but who would know when the doctors tell you that jaundice is so common and nothing to worry about… How about a pamphlet with all the warning signs?! Hi, i am from India. My son had total serum bilirubin level of 10mg/dl at age 22 hours (ABO incompatibility). He is a full term healthy child, weighing 3.83kg at birth. After a few hours, doctors advised us for phototherapy but due to some unavoidable circumstances, Phototherapy was started at around 58 hours of age. At that point TSB was measured at 13.5mg/dl. It remained at 13.5 in next reading despite continuous phototherapy and then gradually decreased to normal levels. Is there anything to worry. Can a peak level of 13.5mg/dl cause brain damage. This thought scares me…did we wasted too much precious time. It sounds like your son might be very fortunate! We cannot offer medical advice, as we are simply living with the condition ourselves but it seems that it would be unusual for a healthy full term infant to develop kernicterus form a bilirubin of 13.5.